Quick Action: Ask Vita-Mix to bring back the stainless steel blender pitcher! Did you know Vita-Mix, the high speed blender that is so fast it can make hot soup, originally came with a stainless steel container instead of plastic? If you don’t have time to read this whole post, please click the following link to sign and share the brand new petition I posted on Change.org last night asking the company to bring back the stainless steel container. Okay, I’m guessing you have questions. I can explain. Q) Why are you asking Vita-Mix to offer a stainless steel pitcher instead of a glass one like your Waring blender that you love so much, Beth? Vita-Mix is a whole different breed of blender. Its super high speed makes glass unsafe. What’s more, Vita-Mix blenders came with stainless steel pitchers for years, so there’s a track record of success already. Q. Why are you targeting Vita-Mix and not other makers of high speed blenders like Blendtec or Ninja? Vita-Mix is the original and the leading brand in its class. But even more important, the company was founded with the mission of promoting good health. The blender was invented in 1937 by William Grover Barnard, a pioneer in the health food industry, as a way to easily prepare healthy foods. Today, the company is run by William Barnard’s great-granddaughter, Jodi Berg, who is also an advocate for health. Read more about this company’s interesting history in Jodi’s own words. So, with this emphasis on health in mind, and given that Vita-Mix’s customer base is primarily people trying to eat healthily, it would make sense for this company to offer a healthier pitcher option than hard plastic. Blendtec, on the other hand, was founded on the idea of destroying stuff. That said, if you prefer Blendtec or another brand, by all means, contact them and ask for a plastic-free option. But sign and share the Vita-Mix petition too, please. Q. What kind of plastic is the Vita-Mix container made from and how do you know it’s toxic? For several years , the plastic containers were made from polycarbonate and contained the hormone-disrupting chemical Bisphenol-A (BPA). Recently, however, Vita-Mix switched from polycarbonate to Eastman Tritan co-polyester, another type of plastic, which is apparently BPA-free. However, recent studies have found that nearly all plastics contain hormone-disrupting additives, even those that are BPA-free. What’s more, plastics manufacturers are unwilling to disclose the proprietary formulae used to make their plastics, so consumers have no way to know exactly what chemicals could leach out or if any particular plastic is truly safe. Q. Beth, if you’re happy with your Waring blender, why are you starting a petition targeting Vita-Mix? A month ago, the subject of Vita-Mix came up in a Facebook group of green women bloggers. It turned out, many of the women either had one of these machines or wanted one. And I thought, wow. There is so much power in this group. And we are Vita-Mix’s target group. Do we have the power to get this company to switch back to stainless steel? It was exciting to me to try. Even though the group members are primarily green bloggers, we don’t always agree on every issue. This was one that everyone seemed to support. Also, this campaign is not mine. It belongs to whoever wants to get involved. I put up the initial petition on Change.org, but this is an experiment to see what we can accomplish together. Do you have other ideas of how to approach the company? Please go for it. Q. Vita-Mix is really expensive. I don’t think I’d be able to afford one even if the company starts offering stainless steel. What can I do? A while ago, I learned from Jay at Life Without Plastic that there are plenty of second-hand vintage stainless steel Vita-Mix blenders on eBay. 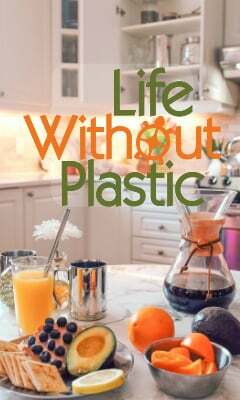 (And if you purchase via this link, My Plastic-Free Life earns a small commission.) That’s where he and Chantal got theirs, and they tell me it works great. (That’s their blender in the image at the top of this post.) Buying second-hand is more eco-friendly anyway! Q. What else can I do besides sign the petition? Here are some ideas, but like I said, please come up with some of your own. 2. Use hashtag #vitamixss so we can track activity. 3. Share the petition on Facebook and be sure to tag Vitamix and use the hashtag. 4. Write a blog post encouraging your readers to sign and share. 5. Send an email to your contacts asking them to sign and share. 6. Write or call Vita-Mix. Here is their contact information. What Do You Think of the Plastic Produce Packaging at Trader Joe's Nowadays? Dear Lotus Foods, Why Package Healthy Stainless Steel in Toxic Styrofoam? This entry was posted in Direct Action, kitchenware, Letter Writing on October 24, 2013 by Beth Terry. A few months ago, my Mother passed her Vita-Mix blender down to me. She purchased it in 1967 when I was 8-years-old. I’m 57 now. The blender still works great, however, the stainless steel canister leaks around the blades. Rather than junking it and buying another blender, I found the procedures to repair the canister on YouTube and was able to purchase new seals on eBay for about $15. Works great. I hope Vita-Mix does bring back their older style stainless steel canisters and blenders. They are made to last. I posted on Vitamix’s facebook page asking why they don’t offer a stainless steel container and they said they’d pass the feedback to their development team! Please post on their facebook to make the request directly so they know how much demand there is! claudia marissa Waring makes machines with either plastic or glass containers. Mine has glass. The one you are referring to is plastic, and because we don’t know what chemicals are in it, we can’t know for sure it’s safe. I would not buy a plastic blender from any company. Glad some of you have purchased the Waring CAC90 for the Vitamix. I have been using mine for almost 4 years and while I do not think the blades are as good as Vitamix (dull rather than sharp) it works out real well for me. Since more people are interested in buying this container, I wanted to remind everyone that I have an extra one to sell. I need to put the base back on the pitcher, but other than, it is perfect. claudia marissa The same plastic (Eastman Tritan copolyester) is used in Waring, Vitamix, Blendtec and many other “BPA-free” blenders. The claim of “BPA Free” is according to the manufacturer, NOT according to several INDEPENDENT (as in not paid or influenced by the manufacturer) scientists. where can I buy a stainless steel jug in the UK ? Does anyone have any experience with the dynablend high speed blender that has a glass container? I only found these 4 models and as you can see on the page it lists the blenders models that these are compatible with and the MX series is not among them. If it fits the waring MX1 commercial blenders it should work. Safest thing is to call waring and ask them or any other retailer if it would fit the same models that the CAC90 container fits. The thing is I only know about the CAC90 which I ordered myself. RedTulie I don’t know if the Waring 32oz. container will fit. Anyone out there know? Does the 32 oz container fit as well? I find that the large container is usually overkill. Would the Waring 32 ounce container fit as well? I find that the 32 oz size is pretty much overkill. Actually it is nice to be able to see through the container. Thomas Fleming Hi Thomas. Good idea; I am wondering if it will fit my Super 5000? Anyone know? Will the Waring CAC35 Stainless steel commercial pitcher fit the Vitamix 5200 base? Has anyone tried any of the 3.5 Horsepower Waring blenders that have a stainless steel container? I wonder if they are as good as the Vitamix? I’m cant seem to find a lot of review of them online. They are pricey. Do you know if the Vitamix wet or dry blade assembly fits in the Waring CAC90 container and is there a 32 oz. Waring option? Vitamix told me a long time ago they want to keep all their manufacturing in USA and to make a stainless container here is cost prohibitive. I wonder where the Waring container is made? Rendirae Trayd76 Yes! The Waring CAC90 container works on the VItamix base (I have a 5200). See my April 27th (post near the top of this comment list) for details. Pricey, but worth it! Hi, Tom. I know this comment is several months old, but I just discovered it in my spam folder. Thank you for this link! Yes, I do still want Vitamix to do the right thing, but it’s good to know there’s an option out there for people who can afford it. Trayd76 Do you know if the Waring CAC90 SS container will fit the Vitamix 5000 base? Dynablend & Waring Extreme are high-speed horsepower blenders that offer glass/steel options. Until Vitamix gives the people what they want, it will continue to give its competitors the upperhand & therefore, lose customers. @Paul They had wooden tampers with the stainless versions. I had to make myself one because the plastic one I had disappeared. Wasn’t very hard to do. In fact it was the Mother Jones article which prompted me to write Vita-mix. It is must read article. This is great! I just discovered your petition which I will gladly sign…but wanted to mention that this afternoon I wrote Vitamix asking them to bring back the stainless containers and to suggest if any of the old stainless containers would work on my second generation blender. Trayd76 Thomas Fleming Thanks so much…great info! Let me know if you need a buyer for the extra Waring container! Trayd76 Cool. Does the Waring work as well as the Vitamix? I.e., do the blades perform the same? Mother Jones just published an excellent article that describes testing whereby Tritan “BPA-Free” plastics leach estrogenic compounds, In fact, the main ingredient, TPP, is even MORE estrogenic than BPA. Chalk to up to marketing, biased-science and high-paid lawyers for the public not knowing. I just sent an e-mail to Vitamix with the above link asking for a no-plastic container! Everyone…please do the same! Also…I tried signing the petition, but it always resulted in an error. Is it still active? I’ll try again later. I wanted to let everyone know that the Waring CAC90 (stainless steel) fits the Vitamix 5200 perfectly. I would like to join green women bloggers, but I could not find this group. Can you please post link to the group. Thank you. Thank you for organizing petition! version included shocking scenes from Plastic Planet Documentary! Excellent excellent! You beat me to it. My husband just called last week to ask them if they had glass. just read your article and see that glass is unsafe. Stainless steel then, all the way! The container seems to be the part that is the poorest quality. Glass or stainless steel… YES! Signed and shared on my FB page and 3 food groups I belong to. Trying to post on mothering.com but it’s not going through. I’ll keep trying. Awesome! Stoked Where do we sign?